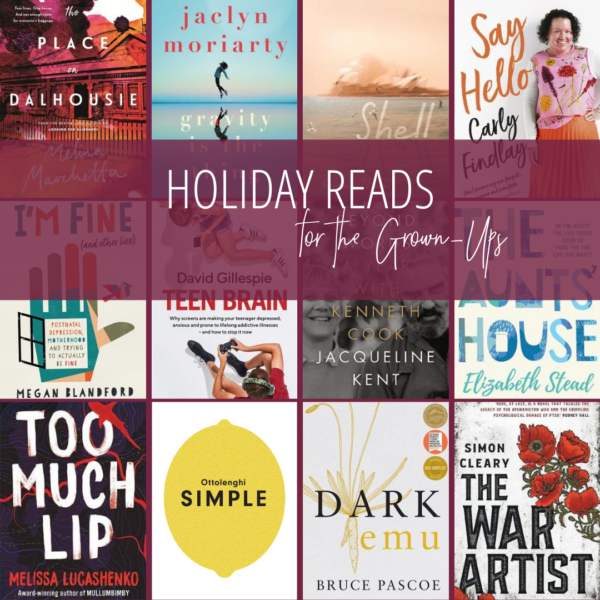 Home » Holiday Reads for Grown Ups! Twice a year I try to post a list of the adult books I am reading and enjoying. To be perfectly honest I do not read a huge number of adult books, preferring to stay in YA and middle grade territory, but I know many of you enjoy an adult book or 20 and are always after suggestions! The list below is what I have on the go and am loving, or have recently finished. 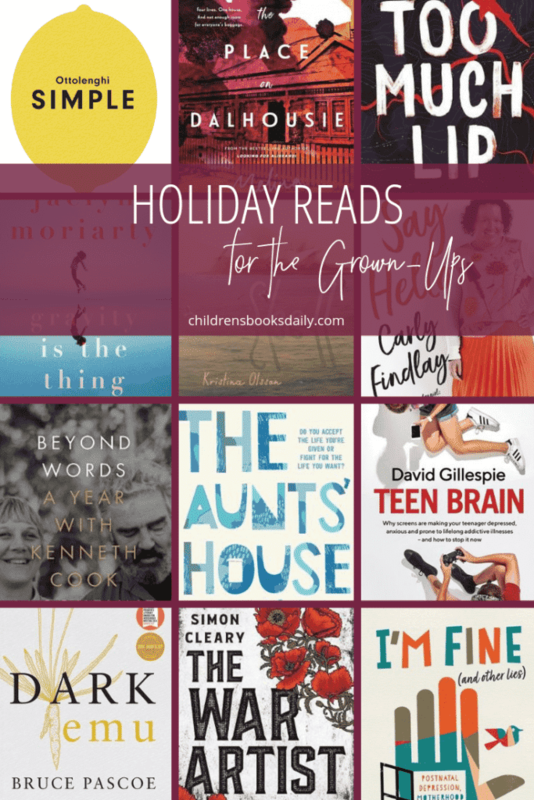 To see my other recent-ish list of grown up reads, see here. To read more about or purchase any of the books from Booktopia, click on title links or cover images. Not strictly memoir or biography, this is a small slice of the story of two people at a pivotal point in their lives. In 1985 Jacqueline Kent was content with her life. She had a satisfying career as a freelance book editor, and was emerging as a writer. She relished her independence. But then she met Kenneth Cook, a man almost twenty years older and author of the Australian classic ‘Wake in Fright’, and they fell in love. Their life together was often joyful, sometimes enraging, always exciting – until one devastating evening. But, as Jacqueline discovered, even when a story is over that doesn’t mean it has come to an end. At just 229 pages, ‘Beyond Words: A Year with Kenneth Cook’ can be consumed almost in one sitting and yet it feels like large amount of love, loss and powerful words is crammed into these pages. I really enjoyed the peek behind the publishing industry as it was in the 1980’s, in a time before Dropbox and social media. But more than this, I just felt so privileged to to be invited to share a relationship built on a shared passion for words and a love that was complex and nuanced. 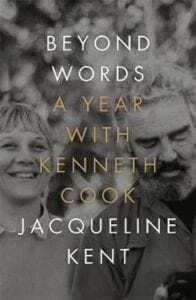 ‘Beyond Words: A Year with Kenneth Cook’ is heartfelt, bittersweet and utterly engaging and I am now keen to work my way through the back catalogue of the books of both these writers. Yep. Moriarty. Yep. They are all related. Jaclyn Moriarty, Liane Moriarty and Nicola Moriarty are all writers of note and they are sisters. 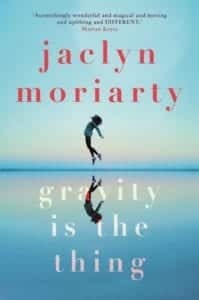 My 11 year old is currently obsessed with Jaclyn’s two upper primary/middle grade books, ‘The Extremely Inconvenient Adventures of Bronte Mettlestone’ and ‘The Slightly Alarming Tale of the Whispering Wars’ so I was interested in her adult debut, ‘Gravity is the Thing’. Abigail Sorenson’s brother Robert went missing one day before her sixteenth birthday, never to be seen again. The book is set twenty years from that day but Abigail has spent her life trying to unwrap the events of 1990, a year in which she also started receiving random chapters from a self-help book called The Guidebook in the mail. She believes the absurdity of The Guidebook and the mystery of her brother’s disappearance must be connected. ‘Gravity is the Thing’ had me laughing out loud and it had me in tears. It sort of smashed me apart and then built me back up and as my 11 year old read the adventures of Bronte Mettlestone, I read the adventures of Abigail Sorenson. It was perfect. I am just so damn pleased to have read this book and it is yet another reminder that children’s authors as the most talented of folk, capable of anything. ‘Gravity is the Thing’ is an extraordinary book, just read it. With her career down the toilet, a husband who was never home, a baby screaming non-stop and her cries for help falling on deaf ears, Megan Blandford spent years saying, “I’m fine”. Spoiler alert (not really): she wasn’t fine. 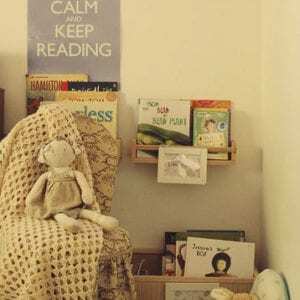 Megan sank into postnatal depression and anxiety, with a highly negative inner voice leading the charge in the battle for better mental health. Until Megan faced a life-changing question: What if the enemy inside isn’t the enemy after all? 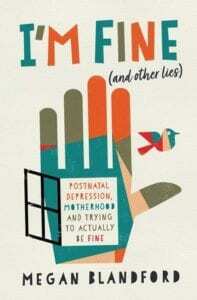 I’m Fine (and other lies) is a touching true story of motherhood: the challenges it presents, and the hope that can be found within it. I am only 3/4 of the way through it but I absolutely had to include this one in my round up. I have found myself nodding, tearing up and smiling as I have made my way through this book and have decided that this, and of course my own book :), are now my ‘must-have’ gifts for new mums. Much more useful than a voucher for a massage that will expire before they have time to use it. Just saying. Is it stressful being Melina Marchetta? I would find it stressful! I mean the woman wrote ‘Looking for Alibrandi’, where do you even go from that? I can’t sing more highly the praises of ‘Finnikan of the Rock’ and ‘On the Jellicoe Road’ but I admit I am always nervous when a new Marchetta is published. Fortunately she is an accomplished writer and each book has held its own…long may this continue! 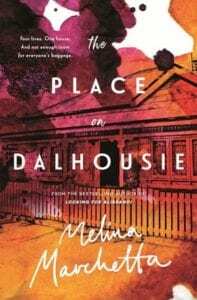 And so to ‘The Place on Dalhousie’ a story of community and belonging. When Rosie Gennaro first meets Jimmy Hailler, she has walked away from life in Sydney, leaving behind the place on Dalhousie that her father, Seb, painstakingly rebuilt for his family but never saw completed. Two years after her fathers death, Rosie returns to the house and living there is Martha, whom her father married less than a year after the death of Rosie’s mother. Martha is struggling to fulfil Seb’s dream, while Rosie is coming to terms with motherhood. And so begins a stand-off between two women who refuse to move out of the home they both lay claim to. As the battle lines are drawn, Jimmy Hailler re-enters Rosie’s life upon discovering that Rosie’s child is his. Having always watched other families from the perimeters, he’s now grappling, heartbreakingly, with forming one of his own . An unforgettable story about losing love and finding love; about the interconnectedness of lives and the true nature of belonging, from one of our most acclaimed writers. In 1965, a time of great upheaval in Australian, Danish architect Jørn Utzon’s striking vision for the Sydney Opera House emerges from the ground and transforms the skyline and unleashes a storm of controversy, while the shadow of the Vietnam War and a deadly lottery threaten to tear the country apart. Pearl Keogh is a fierce young woman and a journalist who has been ‘exiled’ to the women’s pages after being photographed at an anti-war protest. She is also desperate to find her two missing brothers and save them from the draft. Pearl has not seen her brothers since she left them at the orphanage where they were sent after her mother dies and her father’s grief is so all consuming that he cannot possibly take care of them. While this story would be enough on it’s own, we also have the story of Axel, a visionary young glass artist from Sweden, obsessed with creating a unique work for the inside of the Opera House that will do justice to the building. In this big, bold and hauntingly beautiful portrait of art and life, ‘Shell’ captures a world on the brink of seismic change through the eyes of two unforgettable characters caught in the eye of the storm. I admit that I was drawn to ‘Shell’ by the stunning cover and the fact that I knew Olsson’s name from ‘Boy, Lost’, her remarkable memoir. 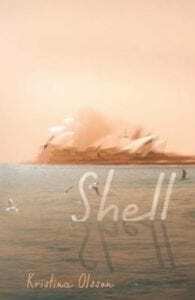 ‘Shell’ is not my normal read – it is a slow burn of beauty and I am an impatient reader, used to the concise writing of YA novels. But I was entranced by the sophistication and elegance of this remarkable novel and am rather proud of myself for reading such a grown up novel! I am so ready to joing an adult book club now! Disclaimer: I have read Carly’s blog for many years and have been an avid social media follower of hers for some time now. I am in awe of her ability to weave words and challenge stereotypes, though I do worry about the toll activism takes on her and the people nearest and dearest to her. 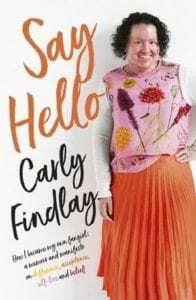 I dearly hope that ‘Say Hello’ reaches a wide audience, and that in writing down her story, Carly can now take a breath, sit back and be immensely proud of all she has achieved. Though she is not a fan of the term ‘inspirational’ (and I am not either to be honest – my grief is not inspirational) I hope she at least feels exceptionally proud of this remarkable memoir. Carly lives with a rare skin condition, Ichthyosis, and what she faces every day, and what she has to live with, will have you cheering for her and her courage and irrepressible spirit. This is both a moving memoir and a proud manifesto on disability and appearance diversity issues. ‘Say Hello’ will challenge all your assumptions and beliefs about what it is like to have a visibly different appearance. Carly has also narrated the audio version of her own book, which can be purchased above in the Apple link. I’m not sure when she fitted this into her schedule, and she clearly has a much more sophisticated sounding voice than I; I was not even considered for the audio version of my book. Ha! 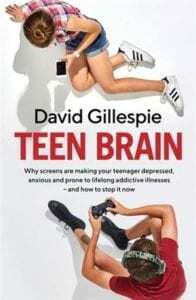 David Gillespie is a lawyer turned author, clearly with a keen interest in a bit of research as he is the author ‘Sweet Poison’, ‘Free Schools’, ‘Taming Toxic People’ and now ‘Teen Brain’. With such a diverse topic list, I would probably have dismissed him, considering him to have spread himself too thinly, were it not for my grandmother buying me a copy of ‘Sweet Poison’ and rabbiting on about it for years, and my academic father rather liking ‘Taming Toxic People’. Also, with a tween child, ‘Teen Brain’ was a topic I knew I had to take an interest in! With their rapidly developing brains, adolescents are particularly susceptible to addiction, and addiction leads to anxiety and depression. What few parents will know is that what we think of as the most typical addictions and problematic teen behaviours – smoking, drinking, drug taking and so forth – are on the decline. Whereas online gaming and social media addition is on the rise. What is doubly troubling is that, unlike drugs, alcohol and cigarettes, electronic devices are not illicit. Quite the contrary. 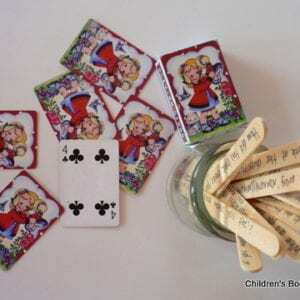 They are liberally distributed by schools and parents, with few restrictions placed on their use. 1/3 terrifying, 1/3 fascinating and 1/3 instructional, ‘Teen Brain’ absolutely resonated with me and I would place it in the ‘must read’ category for all parents. 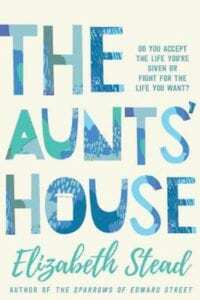 Aunts House’ is the 86-year-old Stead’s sixth novel and is filled with the humour and charisma her readers have come to know and love. 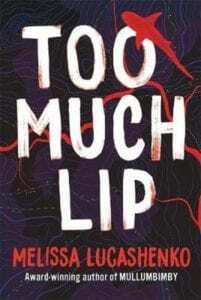 A dark and funny new novel from the multi-award-winning author of ‘Mullumbimby’. Wise-cracking Kerry Salter has spent a lifetime avoiding two things – her hometown and prison. But now her Pop is dying and she’s an inch away from the lockup, so she heads south on a stolen Harley.Gritty and darkly hilarious, ‘Too Much Lip’ offers redemption and forgiveness where none seems possible. Perhaps my favourite of Lucashenko’s novels to date – an absolute must read. Yotam Ottolenghi’s award-winning recipes are always a celebration: an unforgettable combination of abundance, taste and surprise. 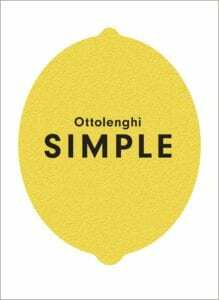 Bursting with colourful photography, ‘Ottolenghi SIMPLE’ showcases Yotam’s standout dishes and they actually are simple. I’ve been cooking my way through this wonderful tome. 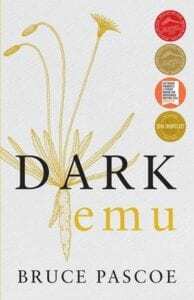 ‘Dark Emu’ injects a profound authenticity into the conversation about how we Australians understand our continent . It puts forward an argument for a reconsideration of the hunter-gatherer tag for pre-colonial Aboriginal Australians. The evidence insists that Aboriginal people right across the continent were using domesticated plants, sowing, harvesting, irrigating, and storing — behaviours inconsistent with the hunter-gatherer tag. Gerritsen and Gammage in their latest books support this premise but Pascoe takes this further and challenges the hunter-gatherer tag as a convenient lie. Almost all the evidence in Dark Emu comes from the records and diaries of the Australian explorers, impeccable sources. When Brigadier James Phelan returns from Afghanistan with the body of a young soldier killed under his command, he is traumatised by the tragedy. An encounter with young Sydney tattoo artist Kira leaves him with a permanent tribute to the soldier, and it is a meeting that will change the course of his life. What he isn’t expecting on his homecoming is a campaign of retribution from the soldiers who blame him for the ambush and threaten his career. With his marriage also on the brink, his life spirals out of control. 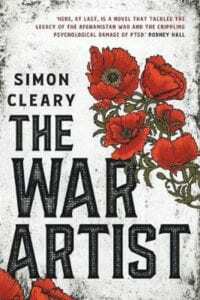 ‘The War Artist’ is a timely and compelling novel about the legacy of war, the power of art and the possibility of atonement.